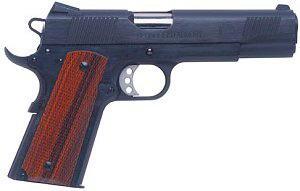 The “Loaded” Springfield 1911 pistol is a .45 ACP caliber handgun. The pistol has a parkerized finish, 5″ stainless steel barrel, fixed low profile combat sights with a tritium front sight, and seven round magazines. The grips are made from Cocobolo hardwood and have the Springfield Armory logo on them.